CEE seniors Amy Moore and Sidney Hutchison, from left. 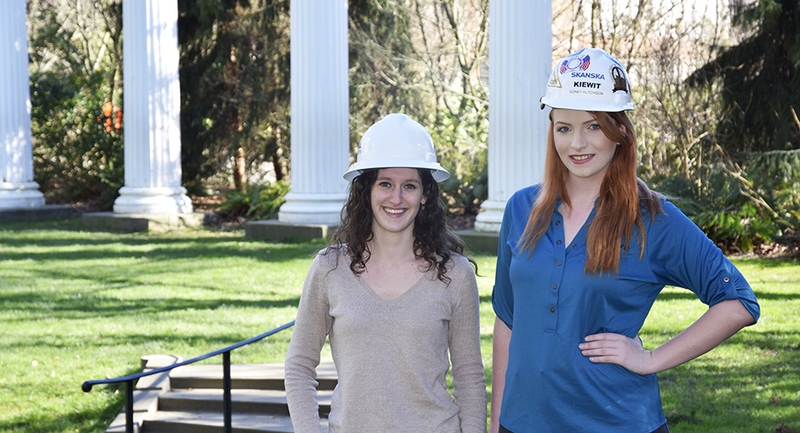 Two CEE students are redefining the meaning of “women’s work.” In the heavy civil construction field, which focuses on building infrastructure such as highways, bridges and dams, females are still largely outnumbered by their male counterparts. Women typically make up only about 9% of the construction workforce, according to the Bureau of Labor Statistics. On the management side, where civil engineers work, females hold about 15% of jobs. But the next generation of heavy civil construction workers, which CEE seniors Amy Moore and Sidney Hutchison are helping to usher in, will likely include more females. The industry is beginning to realize the value that women add to the field. Passionate about working in the field, both Moore and Hutchison recently received Beavers Charitable Trust Scholarships. Learn how both women first became interested in the field, what they enjoy most about working in construction and what their other interests are – such as dance!